Stuart Maxfield and yours truly, circa 1994…as if the hair cuts didn’t give that away! I think that this photograph speaks for itself. The year is 1994. It is my 13th birthday. As a gift of sorts, I was taken to Richmond training at Punt Road. Of course, training was still a Tuesday and Thursday night affair hence all the darkness. Richmond had just won four matches on the trot, in what was to that stage by far the most successful and exciting period I had encountered as a young Richmondite. The boys had just defeated Adelaide at Football Park, a year after being embarrassed at the same venue by 137 points. We went on to finish 9th….a joke now but a vast improvement at the time. Stuart Maxfield. I have never had a player before or since I have loved as much. This may seem odd to some while others may relate. He was scruffy and a bit wild. He thumped the ball onto his boot in the strangest of fashions, and when it worked he could thump it 65 metres. At times it didn’t work but that didn’t bother me. I had his number 27 on my short sleeved guernsey. I bought the numbers and sewed them on myself. The 7 fell off. 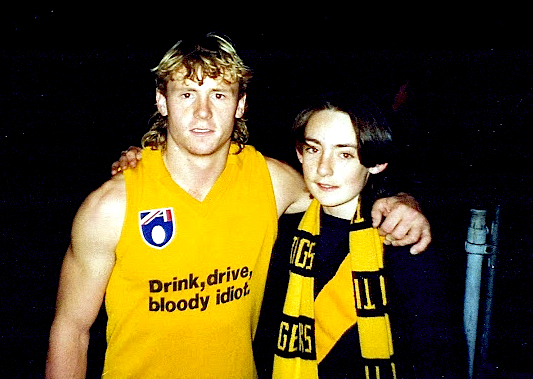 I was heartbroken when, after season 1995, which had been a wild and heady time for this young Tiger, both he and coach John Northey departed Punt Road… Stu to Sydney and Northey to Brisbane. And so it came to be that in 1996, I ventured to Waverley Park to see Maxfield in red and white take the field against Richmond. A truly odd sensation. But the game is the game, and once the ball was bounced, it was only a Richmond victory that occupied my thought. However I did smash my flag in two pieces at the games conclusion, perhaps a mixture of anguish that Chris Bond’s ‘winning’ goal had been disallowed and the subconscious stress of watching my favourite player running around for the opposition. Seeing Stuart Maxfield named as captain of the Sydney Swans late in his career gave me a sense of pride. Although I’d far prefer that he’d stayed at Tigerland, he sensed that Sydney would provide him with more options, and it appeared to happen that way. It would have been lovely to see him lift the Swans 2005 premiership cup aloft, yet injury cruelled him at the wrong time. I still comfort myself with the fact that he was officially the captain of a club the year it won a premiership.